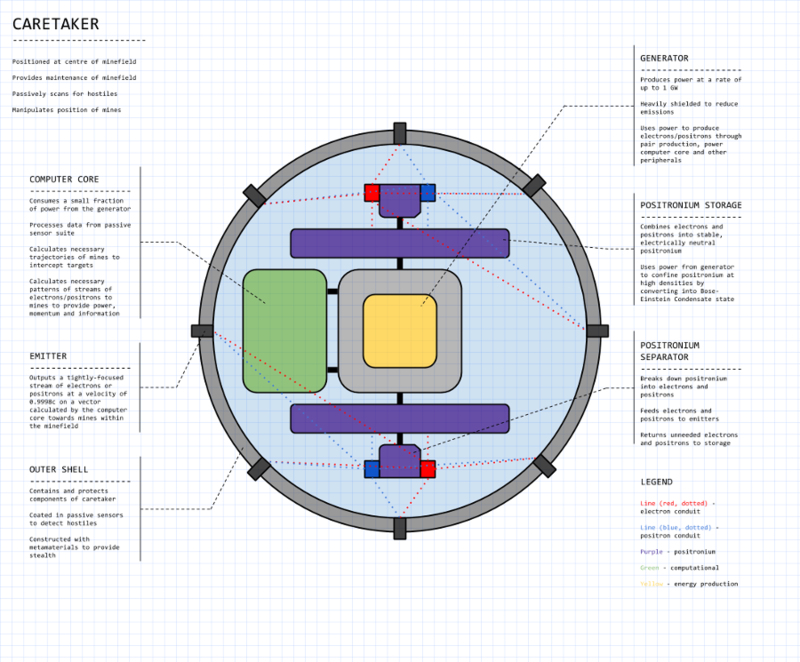 Hey guys, this is just a small idea I've been playing around with for a minefield that would work in space. I do not expect this suggestion to be implemented in Limit Theory, I mostly just made this for the fun of it, but maybe Josh will find something of value from it and in any case I'd be interested to get feedback so I can flesh it out more. Minefields are areas containing concealed, explosive devices designed to cause damage and death to hostiles in the region. This suggestion explores the possibility of mining a 1000km x 1000km x 1000km volume of outer space with a uniform distribution of 1000 mines that use positronium as a payload. 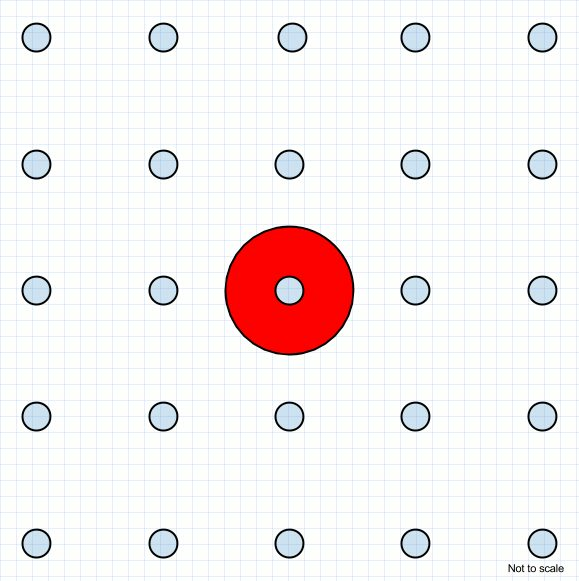 The minefield should cover as big a volume of space as possible and be scalable to larger volumes. The minefield should be as quick to establish as possible. The minefield should not be easily detectable using long-range scanners. The minefield should have a high chance of intercepting hostiles passing within it. The minefield should be capable of inflicting a high degree of damage upon hostiles that it intercepts. The minefield should remain operable for a long period of time and remain largely self-sufficient. The suggestion should conform as well as possible to our current understanding of the laws of physics. The following is how I envisage one kind of minefield to be in space. At the centre of every minefield is a type of entity called a caretaker. Surrounding the caretaker are the mines that the caretaker is in charge of. The mines will be laid out around the caretaker using a particular layout. 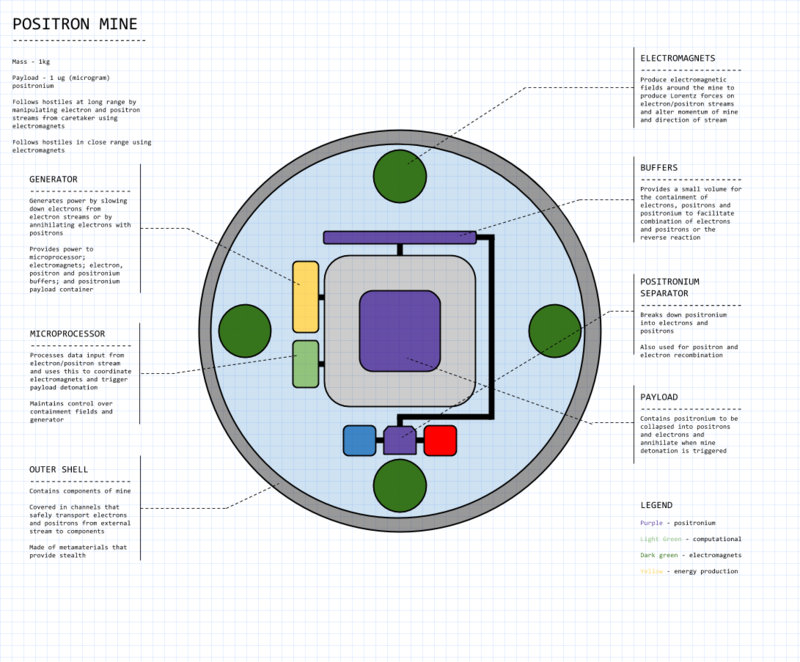 The layout that the mines adopt are configurable, and can be changed using the user interface. In the UI, the minefield is displayed as a graph of nodes, where each node represents a mine. Changing the layout of the nodes in the graph then directly corresponds to changing the layout of the mines in the minefield. This would fit in perfectly with the work Josh has already done, as seen here (19:43). Cubic - The minefield is divided into sectors of equal volume, each one a cube with eight mines forming the vertices. The distances between mines are all equal. Hexagonal lattice - Mines are divided into layers along one axis, and each layer consists of a tessellating arrangement of hexagons along the other two axes. Mines are positioned at the vertices of these hexagons. Think of graphene! Spherical - The mines are arranged into football-like structures that approximate a sphere. This arrangement is non-tessellating. Each different layout will presumably work better in different situations, against different kinds of hostiles exploring the minefield in different ways and with different velocities. I don't actually know because I can't think of any particular situation where a hexagonal lattice arrangement would serve better than a spherical arrangement or vice versa. I just think it would be cool to change the layout using Josh's layout algorithms. That being said, everything else in this suggestion is only included because it's necessary. For the remainder of the suggestion, I assume the minefield layout to be cubic, as shown below. In this layout, a sector is defined to be a cubic volume of space within the minefield bounded by 8 adjacent mines. It manipulates the positions and velocities of all of the mines within the minefield. It provides maintenance to all mines within the minefield. It passively scans for hostiles entering the minefield. 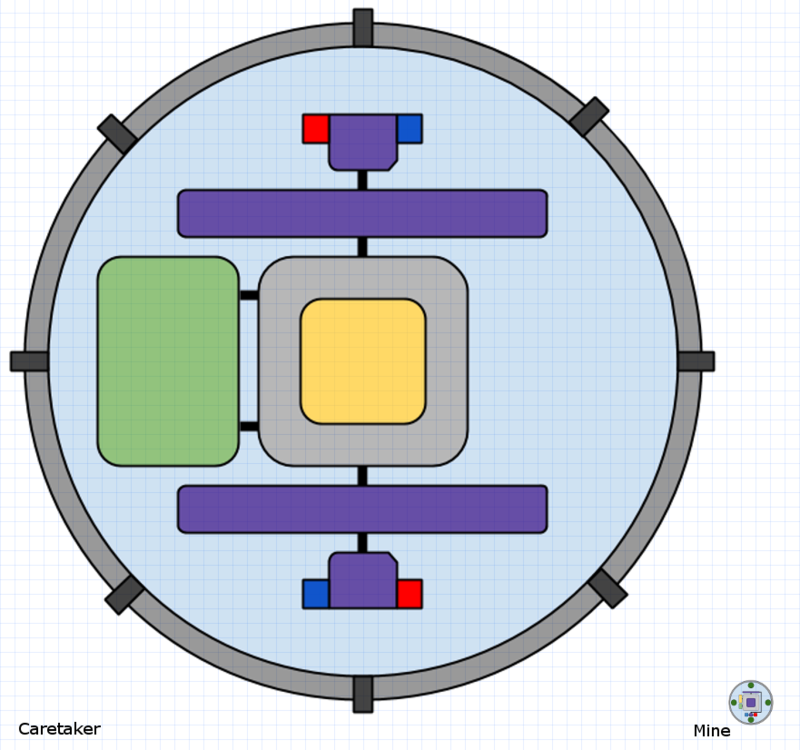 The caretaker is spherical and has a large mass relative to mines but a mass equal to or less than the typical fighter. It consists of a power generator that has a maximum rated power supply of 1 GW, and is capable of using this energy to produce electrons and positrons using pair production. This generator is heavily damped by shielding around it to reduce emissions. It receives and processes information from the passive sensor suite lining the outer shell (see below). If a hostile is detected, it calculates the velocity vector of the hostile. When a hostile's velocity vector is calculated, it computes the trajectories of nearby mines necessary to intercept it. When the trajectories of mines are calculated, it works out the appropriate vectors to beam electrons and/or positrons along (see below). It controls the other components: the generator, the positronium containment compartments and the positronium separators (see below). The caretaker's outer shell is composed of meta-materials that provide better stealth to the caretaker, and is also lined with passive sensors that monitor for incoming radiation that indicate the presence of possible hostiles. This data is routed to the computer core. The outer shell also contains emitters spread uniformly around the surface. These emitters accelerate electrons and positrons produced within the caretaker to high velocities (0.1c) along vectors computed by the computer core. It directs these particle streams towards mines for reasons explained below. The electrons and positrons that feed the emitters are obtained in one of two ways: either directly from the generator (via pair production), or through the dissolution of positronium in storage into electrons and positrons. Positronium is an electrically-neutral system in which an electron orbits its antimatter equivalent, a positron. The purpose of positronium production and storage is that it acts as both a battery and a buffer storage for electrons and positrons in case the generator cannot produce them fast enough. Positrons and electrons would be difficult to store separately as a group of each stored separately would generate strong electric repulsive forces even in small quantities, and hence would require a lot of energy to contain. Although positronium is typically very unstable, there are existing proposals for making it far more stable, by converting it into a Bose-Einstein Condensate state or through the use of crossed electric and magnetic fields. The caretaker is able to power, relay information and control the position and velocity of mines by beaming electrons towards them. To do this, electrons from the generator (or from the dissolution of positronium) are channeled into one of the emitters on the outer shell and accelerated as a beam towards the appropriate mines. For each mine, one beam of electrons is beamed directly at the mine and is used to relay information and provide power. The other beam is directed towards the very local vicinity of the mine, and the mines are able to use electromagnets to produce a Lorentz force on this beam to affect their velocity vector (see: Positron Mine). The positron mine is a 1kg explosive device containing a 1 mg (milligram) positronium payload. It maintains the positronium in a stable configuration until it receives a signal to detonate, at which point it allows the positronium to collapse into positrons and electrons, which annihilate with each other releasing 9.0*10^10 joules (90 gigajoules) of energy. The positron mine has limited automatic functionality relative to the caretaker. It is unable to move by itself, unless in the presence of electrically charged objects. It has no sensor equipment and therefore has no knowledge of its surrounding environment. In normal operation it remains dormant and is extremely hard to detect at any distance beyond close range. Like the caretaker, the outer shell of the mine is constructed out of meta-materials, enhancing its stealth. Instead of emitters, the casing of each mine is lined with channels that can receive an incoming stream of electrons or positrons for the purposes of information transfer, energy transfer, energy storage and payload replenishment. The stream of electrons can be decelerated in a generator to produce power and can also be deciphered by a microprocessor to obtain information (see below). Behind the casing is an array of electromagnets. These electromagnets are used to generate electric fields around the mine that can be used for two purposes. They can be used to generate a Lorentz force on streams of electrons and positrons, which in turn will produce a force on the mine itself (Newton's third law) that can be used to accelerate it towards hostiles, allow it to reposition itself in conformity with a new layout, or return to the caretaker for maintenance. When in close proximity to a hostile ship with a hull made of a ferrous material, they can help guide the mine towards the ship with reduced or zero assistance needed from the caretaker (except possibly to continue to provide power). The mine's payload of positronium can be fed to through combining positrons and electrons received from the caretaker, and small fractions of the payload may be allowed to annihilate in a controlled manner in the generator to produce additional power if power coming from the caretaker is insufficient (or non-existent). In the stream of electrons or positrons, each potential particle that could arrive corresponds to one bit of information. If a particle actually does arrive, this corresponds to bit state 1; if no particle arrives in that moment, it corresponds to bit state 0. Each byte (8 bits) of information is delineated with bit state 1. The assumption is made that each mine will require 1 MB/s information transfer rate when active to pursue a hostile. To satisfy this contraint, the caretaker will need to transmit between 1,000,000 and 9,000,000 electrons or positrons per second to the mine. The delineation between bytes is necessary for two reasons: to maintain synchronisation during data reception, and to guarantee a lower bound to the number of accelerated particles that the mine receives per second, and hence power. Since each potential particle conveys only 1 bit of information, the bit rate is equivalent to the baud rate. When a hostile is detected by the caretaker, it will need to direct mines towards it. However, in certain layouts the direct path between the caretaker and a mine may be blocked by other mines. 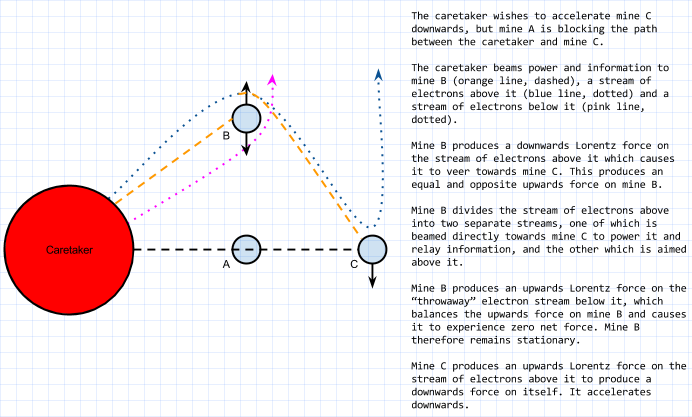 The diagram below demonstrates how the caretaker may use additional mines as relays to provide information, power and momentum to the mines it intends to move. A diagram illustrating the current estimate of the relative scale of the caretaker to a mine is given below. The mathematics used to assess the feasibility of this design is given in rough below. Speed of light, c = 3.00*10^8 ms^-1. Rest mass of electron, m[electron] = 9.11*10^-31 kg. Charge of an electron = q[electron] = 1.60*10^-19 C.
Assume uniform minefield encompassing volume 1000km*1000km*1000km. Assume 1000 mines within the minefield. = 100 km in x, y and z dimensions. Define [b]sector[/b] to be a region in the minefield bounded by six adjacent mines. Volume of a sector = 100km*100km*100km. Assume mass of each mine = 1kg. Assume minefield setup is classified as successful if and only if a mine can reach a target entering a sector it bounds before the target leaves the sector. Assume setup is specified to be successful for targets travelling up to 1000 ms^-1. Assume caretaker needs to provide information to an active mine at 1 MB/s. Assume caretaker needs to provide power to an active mine at 1 MJ/s (1 MW). Assume maximum power output of caretaker is 1 GW. Assume maximum energy capacity of caretaker is 10000 GJ = 10 TJ. Assume message protocol using positronium with 1 baud = 1 bit. Target T enters a sector travelling at a constant velocity of 1000 ms^-1 parallel to one of the axes (e.g. x axis) and along the centre of the sector in the other two axes (e.g. y and z). Assume mine is initially stationary and will need to accelerate at a constant rate to intercept target. Acceleration needed by closest mine to intercept target is 14.1 ms^-2. Force needed by closest mine to intercept target = m*a  = 1*14.1 = 14.1 N.
Electron velocity = d / t = 707106 / 1 = 707106 ms^-1. Delineation between bytes requires 1 electron. Constraints on number and velocity of electrons. 1. Maximum power output of caretaker for production/acceleration of electrons = 1GW. 2. Electrons must be able to cross minefield in 1s -> v[electron] >= 707106 ms^-1. 4. Active mine needs 1 MB/s data feed -> N >= 9,000,000. = 1.64*10^9 J (acceleration component is insignificant). Total power required = energy required / second = 1.64*10^9 W.
1. Total power output of caretaker = 1GW. 2. Total power required = 1.64 GW. 3. Total energy capacity of caretaker = 1000 GJ. It only takes 100 seconds to intercept target. Velocity of electrons = 30,000,000 ms^-1. Velocity lower bound = 707106 ms^-1. Velocity upper bound = 30,000,000 ms^-1. Velocity upper bound >= velocity of electrons >= velocity lower bound. Number of electrons produced / s = 10^22. Number of electrons required for 1 MB/s data transmission = 9*10^9. Energy required = 1*10^6 W.
At maximum operation, the caretaker produces 10^22 electrons and accelerates them to 30,000,000 ms^-1 (0.1c). The change in momentum of the mine is produced by causing a change in momentum of the electron stream. These changes in momentum must be equal in magnitude (conservation of momentum). The mine's electromagnetic field will need to cause a change of velocity of 0.98c for 10^22 electrons in one second to generate the necessary change in its momentum of 14.1 kgms^-1. The mine may need to generate ~2,060,000V to accelerate electrons at this velocity. If the energy generated by slowing electrons beamed from the caretaker (4.10*10^6) is insufficient to produce this voltage, the electrons can instead be annihilated with a portion of the mine's positron payload for vastly increased energy. The positron payload can be refilled by the caretaker simply by beaming positrons rather than electrons to the mine. A 1 kg mine will require 14.1 N of force to accelerate sufficiently fast (14.1 ms^-2) to intercept a hostile target travelling at 1000 ms^-1 through one of its designated sectors in the worst-case situation. The caretaker will need to produce and emit 10^22 electrons (or positrons) per second at a velocity of 0.1c towards the mine. Most of these will be beamed to the local vicinity of the mine so that the mine can produce a Lorentz force on them to alter its own momentum. To alter its momentum sufficiently fast for a 14.1 ms^-2 acceleration, it will need to change the velocity of the particle stream by 0.98c. The necessary electric field may require 2,600,000 V to cause this change in velocity, although this was calculated assuming a uniform, linear electric field when in reality the mine would produce a radial electric field. This is roughly the same voltage as a powerful taser gun. The current required (and therefore power) is uncalculated. It is assumed that the mine requires 1 MJ/s (1 MW) of power and 1 MB/s of data input. A small fraction (24.4%) of electrons output by the caretaker are directed straight towards the mine for these purposes. Edit: Just_Ice_au, I dare you to link old posts and tell me that this has been even remotely explored before. Edit 2: Accidentally was working with assumption that mines were 10 kg each. Updated maths. Edit 3: Corrected payload from 1 ug (microgram) to 1 mg (milligram). I'm not going to alter this in the schematics since this would take time, but just be aware that the payload is meant to be in milligrams now. Last edited by ThymineC on Tue Dec 24, 2013 7:02 pm, edited 5 times in total. I think you've put a scary amount of thought into the best way to kill people in space with mines. 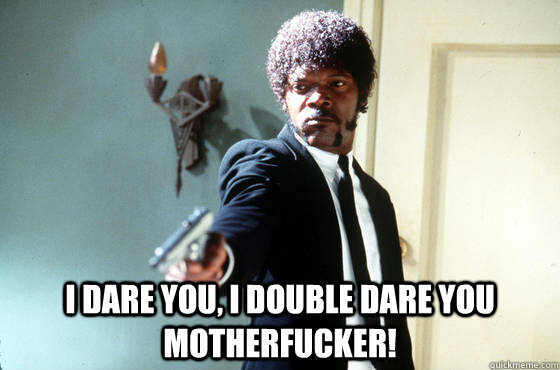 ThymineC wrote: Edit: Just_Ice_au, I dare you to link old posts and tell me that this has been even remotely explored before. Nope, Not touching this one. I put a lot of thought into the best way to kill people in general. The main reason I chose to study artificial intelligence at university was to find a way to painlessly kill every living thing on the planet (or the universe; the idea I had scales well). Also it's no longer my intention to pursue a means to destroy the world. Too much effort; not smart enough. You guys are really awesome people by the way. I felt like I should point that out since it's been a month and I haven't. I thought the idea of mines was interesting when I worked out a few notions about them, but... huh. I clearly need to post some additional system-ideas. I love seeing what creative and motivated people can do with them. Hm. I can't put my finger on it, but my gut tells me that there must be something wrong somewhere. How does the caretaker remain connected to the mine for the full 100 seconds while the mine is flying at an ever higher velocity? Because it has to be accelerated during the whole time, thus energy must be transferred during the whole time without break. What if the ship changes course while the mine is approaching? The mine's acceleration then has to go into directional changes instead of increasing its velocity towards the ship, thereby making it more likely to miss the ship. How close to the ship does the mine have to get in order to damage it? Direct hit? Detonation within tens of metres? Hundreds of meters? Is each mine automatically lost for the field once it gets deployed, regardless whether it reaches its target or not? Or can missing mines be retrieved and return to their original position in the grid? If not, the mine field will be emptied rather quickly, assuming that the caretaker sends more than one mine after a target (which it would do in order to maximise the odds for hitting the target). If yes, this opens a nice way of defeating the mine field: After missing its target the mine will take another 100 seconds of constant deceleration to come to a standstill somewhere in the middle of an adjacent sector. Afterwards it has to return to its original position, which will take another 100 seconds accelerating and 100 seconds decelerating. In other words: once a mine has been set into motion, its sector will be unattended for 400 seconds. So an attacker would send in a probe first in order to set as many mines as possible into motion, and then send his fleet through the emptied sectors after the probe at no risk at all. That's all I can come up with right now. firstly i like your idea of using positron beams for everything. its elegant, but inefficient in my eyes. firstly 1MW and 1MBit for sitting around doing nothing? modern quantum vacuum plasma thrusters already have specific thrust of around 0.1N/kW so you'd get 10 newton of thrust out of 100kW with todays technology. secondly in favour of active metamaterials i'd ditch the passive casing. so you can use lasers for energy transfer and the cloak can pass the laser through the mine and siphon a bit of the energy for the mine itself without having to deflect the energy beam around other mines and expelling energy to correct the momentum change from the deflection. Commander McLane wrote: How does the caretaker remain connected to the mine for the full 100 seconds while the mine is flying at an ever higher velocity? Because it has to be accelerated during the whole time, thus energy must be transferred during the whole time without break. Considering again the 1000km*1000km*1000km cubic arrangement with 1000 mines, each sector will be 100km*100km*100km. In this case, the closest mine to the caretaker will be either 100 km or 50 km (depending on whether you place the caretaker at a vertex of the sectors or in the centre of one). 50 km is the worst case so take this. The maximum velocity that a mine will attain in the example I gave is 1410 ms^-1, as you write below. In the worst case, the mine will be moving perpendicular to the line that intersects the caretaker and itself. So the necessary tracking rate is 0.03 rad/s or 1.72 deg/s. I can't tell you about real-life, but in EVE Online a tracking rate of 0.03 rad/s corresponds to a pretty slow-tracking turret. In fact, tracking a 1400 ms^-1 target at 50 km is probably standard engagement practice for something between, say, a battlecruiser/destroyer with medium-size turrets against a MWD-equipped frigate. This is the worst-case situation and in any case there are multiple emitters on the outer shell of the caretaker. As you said, it will need to continuously track the mines and beam electrons (or positrons) towards them for them to function appropriately. In the worst case scenario in the example configuration I gave, yep. 1410 ms^-1 isn't actually all that fast for objects in space. Commander McLane wrote: What if the ship changes course while the mine is approaching? The mine's acceleration then has to go into directional changes instead of increasing its velocity towards the ship, thereby making it more likely to miss the ship. Well this is an issue with pretty much any kind of tracking projectile anyway. Bear in mind, it won't just be one mine but several that the caretaker will be directing towards the ship, and a sudden direction change by a ship might reduce the chances of one of the mines hitting it, but perhaps significantly increase the chance of another one doing so. Commander McLane wrote: How close to the ship does the mine have to get in order to damage it? Direct hit? Detonation within tens of metres? Hundreds of meters? Typical of mines, the closer the better. As for how close it needs to be, that depends on the shield and hull integrity of the hostile. In theory, the mine can come directly in contact with it before it needs to detonate, though the closer it comes, the more chance there is of it being detected beforehand. Its payload is currently set at 90 GJ, equivalent to 21.5 tons of TNT. For reference, a 20 ton explosion looks like this. Considering that there's only 1000 mines, I may consider upping the payload to 5 micrograms of positronium to get something more like this. At its maximum output, the caretaker would be able to produce the equivalent of this payload for all of its mines every 7.5 minutes, but the main problem will be containment of the matter in a 1kg mine. Commander McLane wrote: Is each mine automatically lost for the field once it gets deployed, regardless whether it reaches its target or not? Or can missing mines be retrieved and return to their original position in the grid? Any mine can be retrieved and returned to their original position if they have not been detonated. Mines only require nominal self-generated power to remain operational and receive most of their energy from the caretaker when they need to be repositioned. Commander McLane wrote: If yes, this opens a nice way of defeating the mine field: After missing its target the mine will take another 100 seconds of constant deceleration to come to a standstill somewhere in the middle of an adjacent sector. Afterwards it has to return to its original position, which will take another 100 seconds accelerating and 100 seconds decelerating. In other words: once a mine has been set into motion, its sector will be unattended for 400 seconds. So an attacker would send in a probe first in order to set as many mines as possible into motion, and then send his fleet through the emptied sectors after the probe at no risk at all. That's actually a pretty clever tactic. In fact, it's so clever that I'm sure the earliest fleet commanders did that when they first encountered these kind of minefields. So the mine deployers adapted and programmed the caretaker to notice such tactics. If we were dealing with purely "dumb" mines that just lock on to nearby hostiles and pursue, then this tactic would be viable every time. However, the behaviour of the mines is controlled by the caretaker, and the caretaker is large enough to fit an array of fairly powerful computers. I can imagine the the caretaker may employ some form of case-based reasoning. Every time it encounters hostiles, it records the situation and the outcome of that situation and stores it within its databanks. Then each time it detects hostiles, it compares the current situation (the current case) to the set of previous situations (cases) and tries to find the closest-matching one. It examines what the outcome of that situation was and reasons about the probability that the outcome of its current situation will be similar to that. It then manipulates the surrounding mines accordingly. So when you send a probe in first, thinking you're so clever, what you may not realise is that the caretaker has seen the same tactic 50 times before. Even though you know the minefield is there, you can't directly detect the 1 kg mines located at 100 km intervals from you, so you take it on faith that your tactic worked. In fact, what the caretaker did instead was predict what you were going to do and perhaps only direct one or two mines towards the probe while keeping the rest in reserve in expectation of a fleet. Which is exactly what happens. Of course, you may try to be super, super clever and realise this and pull off a tactic that the minefield has never seen before, allowing your fleet safe passage through it. But that's the fun of the game! It's a battle of wits between you and the caretaker, and you have to take it on faith that you're cleverer than it is. Last edited by ThymineC on Sat Dec 21, 2013 10:10 am, edited 1 time in total. I just realised that my idea revolving around this "caretaker" arose via a subconscious association with the Caretaker from Star Trek: Voyager, which generates a displacement wave that thrusts the eponymous space vessel into the Delta Quadrant, which is very closely linked to the wave-propulsion ideas I've spent a week or so thinking over in Is anyone here a physicist? There's of course one one problem still left, which is of course still the vastness of space. Once the mine field is known, it requires no effort at all to circumnavigate the 1000km x 1000km x 1000km cube. 1000km may sound like a lot, but in space it's nothing. Cornflakes_91 wrote: [engineering]firstly 1MW and 1MBit for sitting around doing nothing? 1 MW and 1 MB (megabyte) for when the mine is activated and its microcontroller needs to manipulate the electromagnets accordingly. Otherwise nominal, periodic power and no data transfer needed when dormant. Quantum vacuum plasma thrusters seem promising! No propellants required and an input energy/thrust ratio of 1 kW/0.1 N is great. Only questions - does this approach lead to any significant heat generation or other emissions, and how big would the hardware need to be to do this? I need to minimise emissions and size as much as possible. Cornflakes_91 wrote: secondly in favour of active metamaterials i'd ditch the passive casing. That sounds like a really awesome idea and cool as hell besides. Having the caretaker emit lasers that are guided through a series of mines in space sounds awesome. Commander McLane wrote: There's of course one one problem still left, which is of course still the vastness of space. Once the mine field is known, it requires no effort at all to circumnavigate the 1000km x 1000km x 1000km cube. 1000km may sound like a lot, but in space it's nothing. Oh yeah, certainly. I should have pointed out, these kind of minefields would be used to defend chokepoints and the like in space. For instance, Josh is planning to have interstellar travel occur using gates. I might set up a minefield somewhere along the vector that connects one gate in low-sec space to another. Ships travelling between these gates may get caught in the minefield, though I may need to set it more towards one of the ends of the trip than the middle, as they'd likely be travelling too fast in the middle to get caught. This is bit like warp disruption fields in EVE Online. Alternatively, if I have a pirate base hidden in a nebula and I didn't want people snooping around, a minefield covering a 1000km*1000km*1000km volume of space within the nebula should be more than sufficient for that end. Because the mines are controlled by a caretaker and not simply "dumb", you can configure the caretaker to differentiate between hostiles and non-hostiles, and so you could safely inhabit your own minefield. Actually, I really like your ideas Cornflakes. I'm scrapping the idea of electrons and positron beams for now. Instead, the caretaker generates a stream of high-energy gamma photons, at least 1.022 MeV each, and at a rate of 6.11*10^21 s^-1 that are directed towards mines. The pattern of photons encodes a message pattern similar to the one I had with electrons and positrons, with each potential arrival of a photon at a mine at a given moment corresponding to 1 bit of information. With the 1 bit delineation between bytes, the upper bound for information transfer would therefore be 6.8*10^20 bytes.s^-1 (680 exabytes.s^-1) which would be far more than required. Mines extract information and energy from the photon stream passing through them using meta-materials like you said. They also use these materials to bend the stream of light towards the target mine (if they're only being used as relays themselves). The target mine will use the photons as a source of power, propulsion, and can even recombine the photons to form positrons and electrons, that in turn can be combined to form positronium in case they need to replenish their payload. The mines will use quantum vacuum plasma thruster technology to reposition themselves and pursue hostiles, using the energy and information they obtain from an active photon stream directed towards them. This approach obviates the needs for the transmission of electrons and positrons through space, and for electromagnets in the mines. ThymineC wrote: 1 MW and 1 MB (megabyte) for when the mine is activated and its microcontroller needs to manipulate the electromagnets accordingly. Otherwise nominal, periodic power and no data transfer needed when dormant. 1MByte/s is much for saying "deflect it that way"
I'd put an small specialised processor in the mine that does not need more info than the target and approach direction of the positron beam. Or even less, just the direction it should move. As the approach direction is known. In effect it would boil down to a couple of kb/s. ThymineC wrote: Quantum vacuum plasma thrusters seem promising! No propellants required and an input energy/thrust ratio of 1 kW/0.1 N is great. Only questions - does this approach lead to any significant heat generation or other emissions, and how big would the hardware need to be to do this? I need to minimise emissions and size as much as possible. Well, qvpt have less emissions than a magnetic field capable of turning a relativistic particle beam on a dime and producing a ton of synchrotron radiation by doing so. An extended frame format consists of 128 bits, and carries up to 8 bytes of information. Based on a 1 MB.s^-1 = 8 megabit.s^-1 information transfer rate, I can transmit ~524 bytes of information every millisecond to the mine. Given that I want it to make adjustments to its velocity vector on a millisecond basis, as well as give it information on whether to pass on the input stream to another mine or not, etc., I think this is about appropriate. You have to bear in mind things like cyclic redundancy checking as well. Oh okay, I get you now. Yeah that sounds good.